The Fellowship was fortunate enough to obtain a copy of THE CHAIR from Alterna Comics. The story is by Peter Simeti, with art by Kevin Christensen, and Peter Simeti. Richard Sullivan had a good life until he was convicted for a crime he claims he did not commit. He has spent the last ten years on death row and doesn’t know what is worse: the violent criminals that are around him, or the sadistic warden and guards. Then his fellow inmates start dying off one by one in horrible and sadistic fashion. Sullivan starts to wonder if he can keep his sanity while trying to figure out how to escape from this hell. Simeti has written a great little story here. There is a shocking “reveal” toward the end that I did not expect. I won’t say what it was, but it really caught me off guard. The art creates an atmosphere of dread, terror, and isolation that Sullivan faces. The use of black backgrounds and thick shading adds to this atmosphere very successfully. If you like crime drama, I would highly recommend this book. 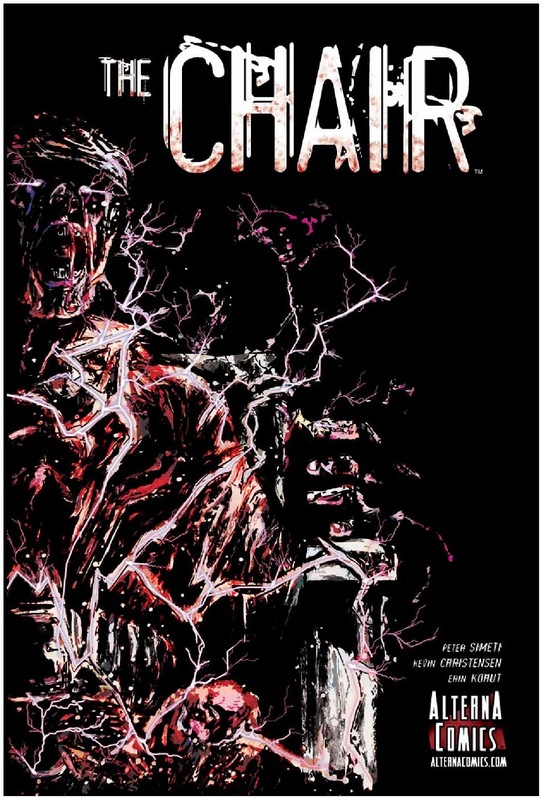 THE CHAIR is stores now or available for ordering at Alternacomics.com.